Hyggelig studio, ideelt for familier og par, i nærheten av sentrum og strender. strendene i Antibes og Juan les Pins, Mas de Tanit ligger i et rolig boligområde 500 meter fra sentrum, er en bolig innredet med en anlagt park med svømmebasseng. Denne beliggenheten gjør at gjestene kan nyte stranden atmosfæren og animasjon av en festlig by på den franske rivieraen (Nice, Monaco, Cannes ...). Marine vil glede barn i perioden fra slutten av mars til slutten av september. Siden dette komfortable 27m2 studio med terrasse (9m2), i første etasje, er du bare noen minutters gange fra strendene og butikkene i Antibes og Juan les Pins. Digital lås og vakt i boligen. jordisk parkeringsplass i bolig som er helt avgjørende i månedene juli og august. Køyesenger: Sleeping Top: 90x190 cm og sovesofa 90/140 (fold) x90 cm. Utstyr bad: 1 bad med toalett. Utstyr på kjøkkenet: kjøkken åpent til stue. I have been living for 1 month. The appartment is nice due to the fact it has everything you need and the attention of the host is very good. The only negative point is that the WiFi is not included, you must buy a data plan. Thanks a lot for the comments. Hope to see you a next time in Antibes. The apartment is well located, close to different bus lines, supermarkets and restaurants. The beach is also near by. There are plenty of kitchen utensils and it has good quality appliances in a big number. One big issue is the bed. I took the apartment because it had a double bed (unlike many other accommodations in the area), but it is actually a bed of 1.5 places, therefore not that big. It was also difficult for me to sleep on that bed because it has some dust (it needs some ventilation - allergy). I ended up sleeping in the sofa-bed which is extremely noise, although it is comfortable for being a sofa-bed. The other big issue that I had was the internet. There is no internet! There is a scares contract of 1GB per week or 5GB per month and it is not even that fast. The owner offered me one week for free (thank you for that), but I did not use it much because it was very slow (3G). I ended up using EU roaming. I did not like this matter because it was one of my filters when I was looking for the accommodation. The TV programming is quite good, with plenty of films in the evening (but not on the weekends). There are also many channels. It was a good point to compensated the lack of internet connection or watching video streaming. I am not sure that I would repeat if I were to go back, but it would also depend on my visit. This time I was there for work maybe if your stay is for leisure it may be worth it. Again the flat is worth it, but it lacks this two things. We would like to thank you for your valuable comments. As a matter of fact, despite 5 mastresses available, you chose to sleep in the corner dedicated for kids. We take note about your remark related to the dust and were are sorry that you suffered from allergies. We will review this aspect with our contact person in Antibes. The sofa bed has been bought less than one year. For Internet, the appartment is connected with a Wifi Box with a well known French Internet provider, which needs to be recharged at your own cost and according to your needs. It is also mentioned in Abritel and within your contract. We may think in the future for a more convenient solution. Any time you are back to Antibes, we will be happy to offer you a free night to compensate those inconveniences. Un appartement super avec toutes commodité proche de tout. Un super accueil. Nous avons passé un super séjour et nous ne manquerons pas de revenir. Merci pour tout. Merci beaucoup Sandrine pour l'appréciation. Au plaisir de vous revoir. Very clean and central to all amenities.pool beside appartment. Thank you for this nice appreciation. Bel appartement, très bien équipé dans une jolie résidence bien entretenue. La localisation est parfaite, à 5 minutes de marche du coeur animé de Juan et proche des plages de Juan et Antibes. Nous avons apprécié la présence du parking sous terrain car il est très difficile de se garer dans Juan. Très belle piscine dans la résidence , hélas trop fréquentée en plein mois d'août. Une mention spéciale également pour l'accueil très sympathique à notre arrivée. Bref, que du positif. Je recommande! Merci Fabrice pour ce gentil commentaire. Ravie que vous ayez passé un agréable séjour. Good location and very well equipped. I stayed in Antibes during two months and the apartment was according to description. Very good central heating and ventilation. 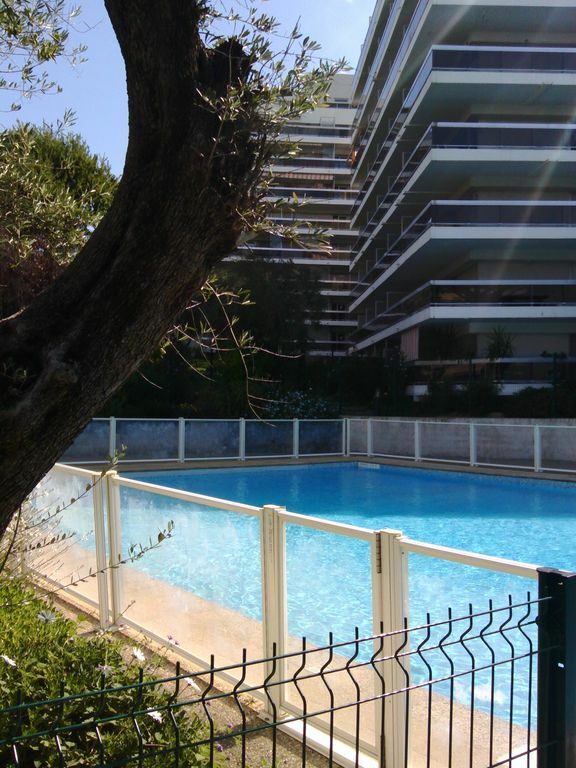 Good location in a quiet area near Juan les Pins with its lovely sunsets. Shops, restaurants and tourist office just minutes away. There is an underground garage but you really don´t need a car. Buses are frequent and cheap. I really recommend this studio.